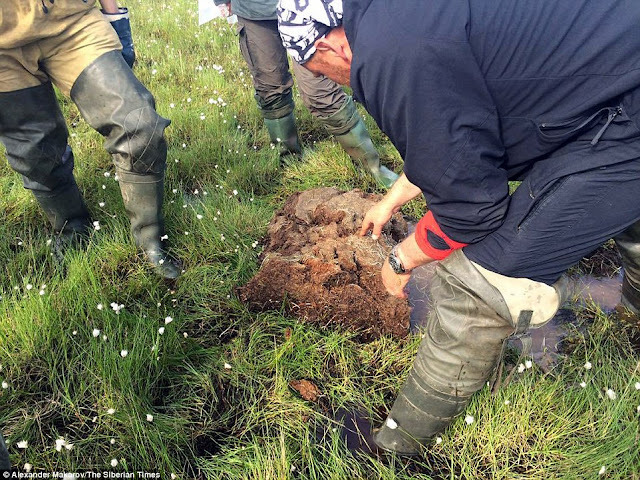 Bubbles of gas have created wobbly waterbed-like patches of ground in the Yamal Peninsula after unseasonably high temperatures sparked bizarre underfoot conditions. The fun-looking patches of bubbling land were discovered by researchers Alexander Sokolov and Dorothee Ehrich. Some 15 examples of the phenomena were discovered in the area, according to The Siberian Times. When the patches were punctured, methane and carbon dioxide gases were released, according to the pair. The researchers theorize that unusually high temperatures in the area may have caused permafrost to thaw, releasing gases and forming the bubbles. Normally the ground in the area is rock hard due to permafrost conditions but this summer has seen temperatures rise so high that polar bears have been forced to leave their melting sea ice habitat in favor of land, according to Sokolov. The bubbles are believed to be responsible for the formation of craters which have appeared throughout northern Siberia in recent years. Known as 'The end of the world' by locals, originally the craters led to theories about their formation, including that they were the result of aliens visiting earth or Vladimir Putin testing rockets. Unfortunately it's nothing as exciting as aliens or rockets, but instead the craters were caused when methane gas under the surface was dislodged by warming temperatures, causing it to expand and explode out from beneath the ground. The release from one crater was so intense that the bang could be heard 100km (60 miles) away and it left a glow in the sky, according to one resident. In the US, bubbly patches of land turning lawns into bouncing castles have been discovered before, usually due to heavy rain. The effect has also been achieved on pavements by the National Art School of Bourges, by placing a pad filled with liquid underneath the bricks.